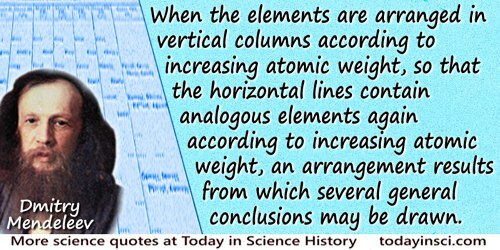 Probably our atomic weights merely represent a mean value around which the actual atomic weights of the atoms vary within certain narrow limits... when we say, the atomic weight of, for instance, calcium is 40, we really express the fact that, while the majority of calcium atoms have an actual atomic weight of 40, there are not but a few which are represented by 39 or 41, a less number by 38 or 42, and so on. Presidential Address, 2 September 1886, Section B, Chemical Science. Reports of the British Association for the Advancement of Science (1886), 569.